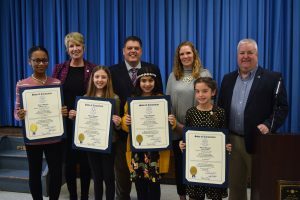 Each student wrote a 300-word essay on the topic with the focus on one notable Connecticut woman, detailing her life and accomplishments and what those contributions mean to them. During the ceremony, the winning and runners up students read their winning essays to the audience, sharing what historic woman was important to them. “This essay contest is always one of my favorite legislative events of the year. Trumbull students and teachers are so awesome; they embrace every learning opportunity, and do such a great job. These students are great representatives of the Town of Trumbull. I, along with Reps. Devlin, McGorty, are truly inspired by them,” said Rep. Rutigliano.